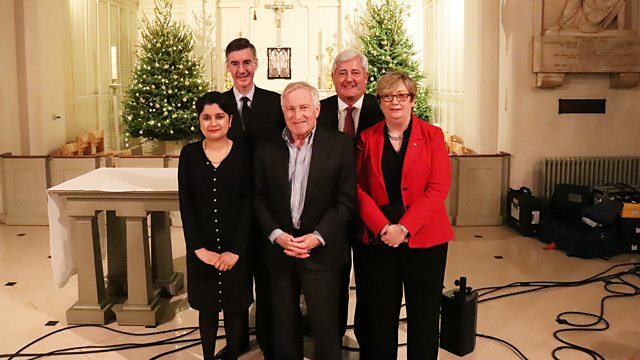 Jonathan Dimbleby presents topical debate from St John's Wood Church in London with Baroness Chakrabarti, Joanna Cherry QC MP, Paul Drechsler and Jacob Rees-Mogg MP. Jonathan Dimbleby presents topical debate from St John's Wood Church in London with a panel including the Shadow Attorney General Baroness Chakrabarti, Joanna Cherry QC MP the SNP's Home Affairs spokesperson, the chairman of London First business group Paul Drechsler and the Chairman of the European Research Group Jacob Rees-Mogg MP. The panel discuss a range of issues including the recent drones disruption at Gatwick Airport, homelessness and rough sleeping, Is "stupid woman" more of an insult than "stupid man"? and Brexit.